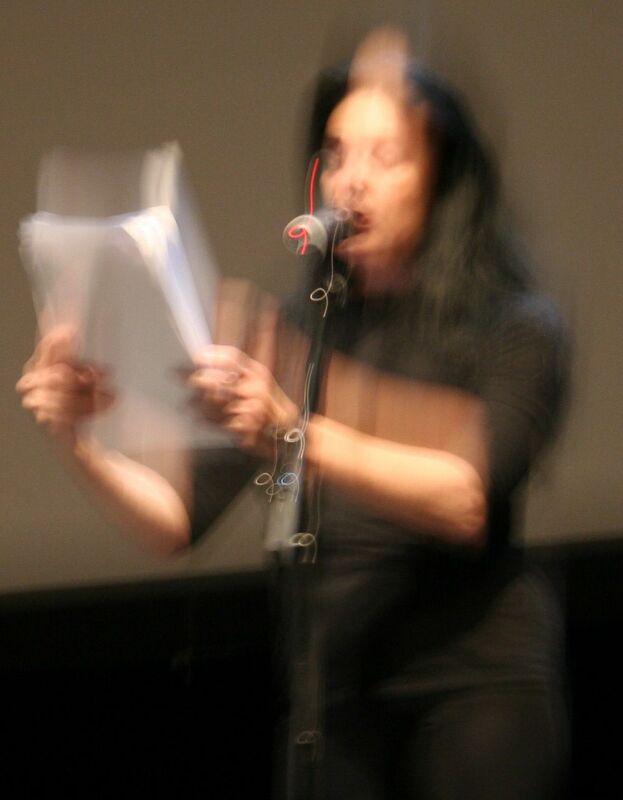 Diamanda Galás reading a collection of her own texts titled ‘In the Mouth of the Crocodile’ at the Weaving Politics Symposium in Stockholm, Sweden. 12/16-2012. A truly remarkable and a very intense experience. The lecture kicked off at 10.00 AM with a screening of an a capella performance of the poem Espergesia by the Peruvian poet Cesár Vallejo (a filmed rehearsal performance at Vigeland Mausoleum in Oslo, in 2012), and it almost kicked in my teeth. The singing-recitation of Espergesia, and the cascade of sound she fires off, projects an onomapoetic Doppelgänger of the poem. A spectre vocalise of Espergesia. The VOICE. Her voice is such a glorious and omnipotent instrument. Firm as a rock from the bottom to the top and with a timbre dense as basalt. Those top notes are absolutely pristine and the lower register has an otherworldly resounding, pure quality. Ghosts can be fierce and instructive wrote Flannery O'Connor. Let us leave it at that. Then Diamanda reads her own texts, which covered a variety of topics; life, death, singing-acting, the art of criticism and much more. Her readings were brilliantly executed with a big palette of different shadings of voice, due to the topic or the theme of the text. Timing, tempi, diction and phrasing were all, the outcome of meticulous preparations and very high standards. Eloquent, to say the least. Who else but Diamanda could combine the virtuosity, adamantine wit, EMPATHY, pitch black humour and expertise on singing-music, like she did? Esto es literatura con cojones, compadres! Todos a casa y haz los deberes! Art speaks the truth, the plainer the better. Later on at the plenary, after the performance, a French intellectual quoted and referred to Diamanda, as he stated "Life is so short-we [the intellectuals] have to be quicker to get to point." I second that, any time. The performance closed with her composition (audio only) to the poem "Man and Woman Go through the Cancer Ward." from 1912 by the German expressionist poet Gottfried Benn. I am convinced that Anton Webern and Dr.Benn would have felt at home in the brutal honesty of the expressionist Klangwelt, created and performed by Diamanda Galás. The emotional impact was and is enormous. This was the sixth time I have seen her live and each performance brought something invaluable to me. This something is going to last a lifetime. Period. "You are standing on the earth, my child." "You are standing on it." "No one really knows, my dear. But you really should keep moving. The crocodiles come at midday." I lay down on the land.